This is a time where everyone hates to remember multiple login details, particularly passwords and companies are trying to break the barrier by providing login less facilities. 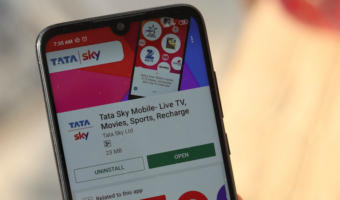 BSNL has been introducing such facilities stage by stage in the name of QuickPay – first for landline, FTTH, DID and later after a long gap similar facility was introduced for WLL/EVDO/CDMA postpaid bills. Now the login less facility has been extended for prepaid mobile subscribers as Quick Recharge. The new facility asks to provide mobile number twice (good move as users may make a typo) along with an email ID. 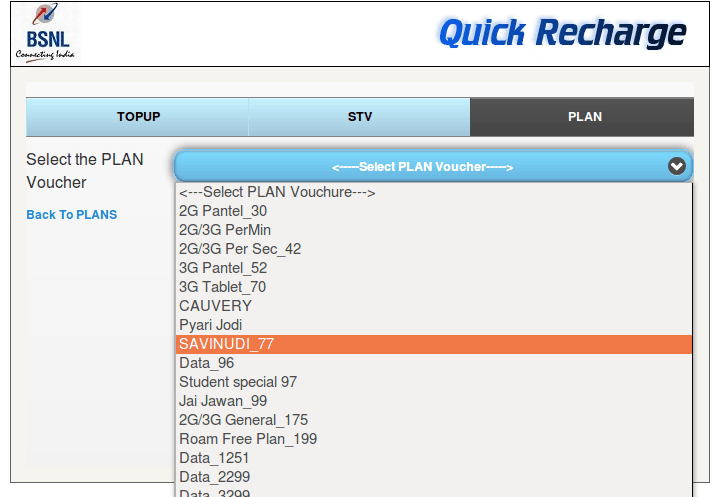 The second screen allows the user to choose TopUp or STV or Plan Voucher. Only available vouchers based on the mobile number provided are shown. Below are the plans in Karnataka. 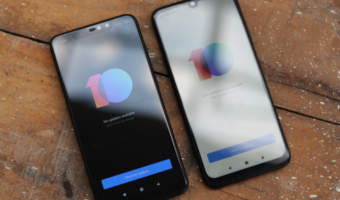 The site also allows users to check the previous transaction and payment details by providing transaction details or mobile number or email ID as may be the case. While things looked good so far, BSNL could not identify their own mobile number! I provided my Andhra Pradesh mobile number wherein I was shown this message. I re-entered my mobile number few times, but the issue prevailed. 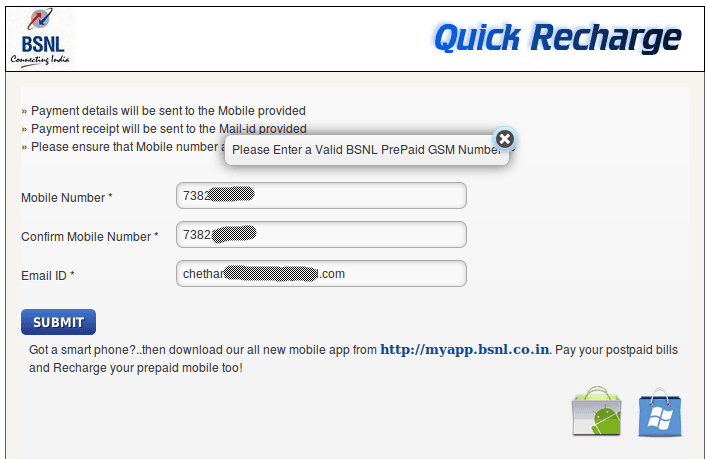 I have a number which starts from 7382, and no it is not an MNP number, but a number series given in AP circle by BSNL! The number is over two years old, and it is a joke that BSNL’s system could not identify their own number. I can’t forgive BSNL as the site is maintained by ITPC, Hyderabad and doesn’t recognize an AP mobile number. 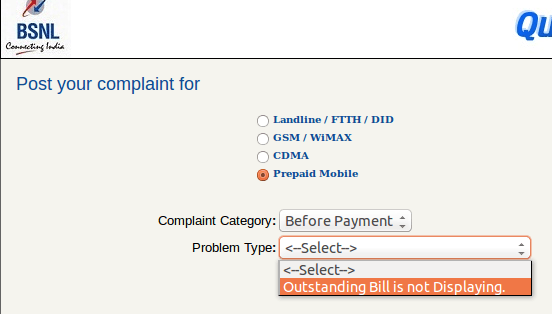 There is a complaint section in the same portal which does not provide a good option for prepaid complaints. I don’t understand how a prepaid customer can have outstanding bills! So readers, will you use this new facility from BSNL? Let us know. Finally, thanks Darshan Malu for the tip. 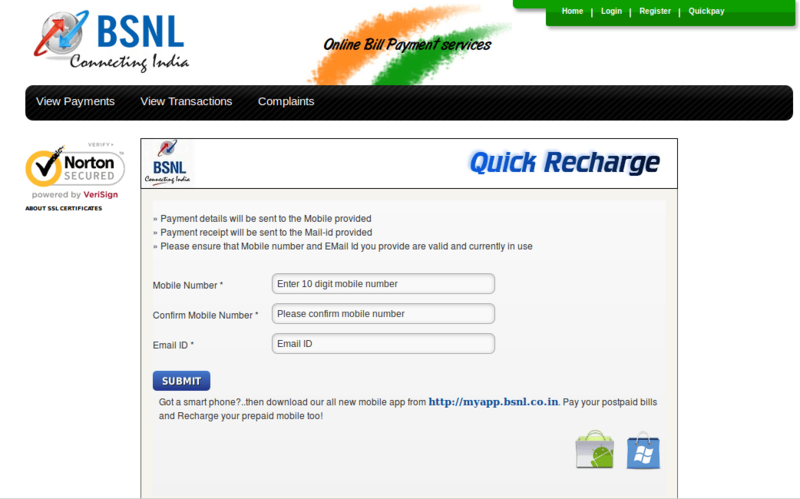 My number starting with 7382 was recognized now by BSNL’s instant recharge website. Now I’m not sure if this is the impact of this article or if the number gets recognized now and then as mentioned by one of our readers in comments below. The other issue of balance and validity displayed to the public still remains. I am having same problem, My number is also being shown invalid GSM number. when i spoke to customer care on 09415024365 at 1322. Customer care suggest not to recharge from bsnl site. He advises me ” you can recharge from other site like Paytm”. 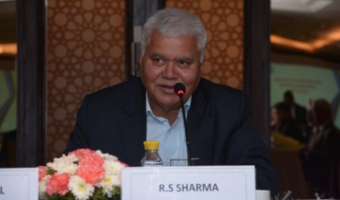 Instead of resolving issue the great bsnl…..advice….